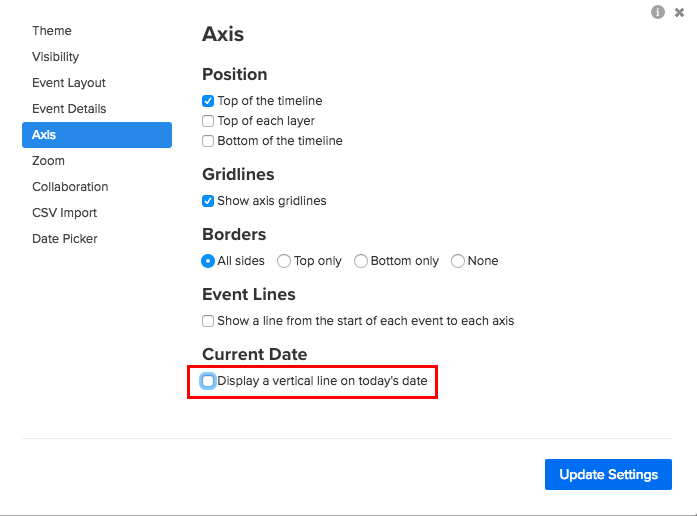 By default, Preceden will automatically determine that months is the best possible scale to view this timeline. When viewed at this scale, there are 14 time periods displayed on the timeline: 12 for the event, plus one on both sides for some padding. There are so many time periods that the timeline winds up looking squashed and you can't read any of the axis labels. Rather than support this, Preceden identifies these situations and displays the "Your timeline cannot be viewed at this scale" notice, letting you know that something is amiss. Preceden also catches these situations and displays the "Your timeline cannot be viewed at this scale" notice. This will update your timeline to automatically calculate the best scale, which in most situations, will fix the issue. Combined with Preceden's ability to automatically figure out the best scale, this will ensure the content on your timeline is displayed properly. 3) Uncheck the Display a vertical line on today's date setting, if you have that setting turned on. 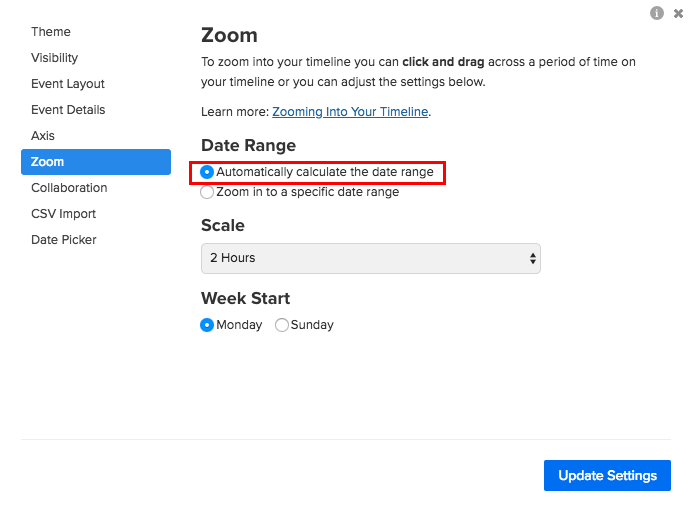 Checking this box can cause issues if you've manually set a date range for your timeline where the time period set is far from today's date. For example, if you have events that span 1990 through 1991, set the scale to quarters, but check the display current date setting, then instead of your timeline spanning two years it now spans more than 25. Viewing 25 years worth of events in a quarter scale would result in over 100 time periods, which Preceden doesn't support. In rare cases, even with automatic scaling and date ranges, your timeline's content won't be able to be displayed. We've only seen this in cases where the events on the timeline span several hundred thousand years. Even in most of those cases, Preceden is able to display the timeline without issues. If you run into a situation where you're always seeing the "Your timeline cannot be viewed at this scale" notice no matter what, drop us an email at help@preceden.com and we'd be happy to take a look. Similarly, if you believe your timeline should be viewable at a certain scale, but it isn't working, we can take a look to figure out what the cause is.